Before pool chlorinators, it was necessary to handle and store harsh chlorination chemicals in order to keep your swimming pool clean and safe for everyone to use. 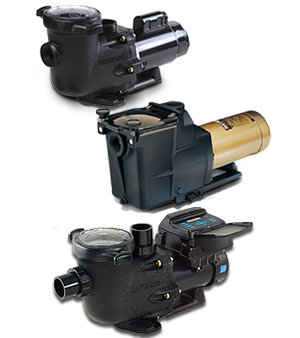 Today, advancements in the pool industry bring us a simpler and safer alternative; Salt Chlorination. How Popular is Salt Chlorination? Nearly 1 million households worldwide have chosen to sanitize their pools with Hayward Salt Chlorination Systems. Salt satisfies 100% of your pool and spa’s sanitization needs, always leaving you with clean, clear, and luxuriously soft water without you lifting a finger. With salt chlorination, you can get all the benefits of a conventional chlorinated pool – clean, clear water – without the negative side-effects, like chemical odors and irritated skin and eyes. Instead of using chemical chlorine to sanitize your pool, salt chlorine generators work by converting conventional salt into chlorine – it’s as simple as that! Here’s how it works: Salt is added to the pool, and then pumped through an electrolytic cell where it’s converted to chlorine and then pumped back into the pool. The result is a clean, clear, luxuriously soft water that is less work and worry for you – and your wallet. How Do I Maintain A Salt Chlorinated Pool? As with any pool, you need to check pH, alkalinity, hardness and chlorine levels on a regular basis. Most pool retail stores will perform this test for you at no charge. Salt chlorination, which does not vary much, should be also be checked regularly, but this may be done every other month or so. Again, many stores will perform this test at no charge. If you are the Do-It-Yourself type, many different test kits are available for at home use. 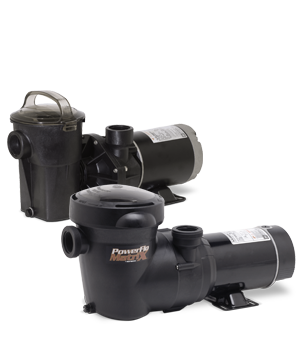 Depending on the use of your pool, you may need to adjust your salt chlorinator’s chlorine production to a higher or lower output level to keep the chlorine level where it needs to be. If there have been a large number of swimmers in the pool, if you have had heavy rain or if the pool water is cloudy, you can put the chlorinator into “Super Chlorinate” mode where it will automatically generate the maximum amount of chlorine for the next 24 hour period. Salt Cells should be inspected for calcium build up about every 500 hours of use (our systems have a “Check Cell” LED light will illuminate every 500 hours to be used as a reminder) and cleaned if necessary. The most convenient time to clean your cell is prior to turning on your salt system at the beginning of the pool season (for people who close their pools). 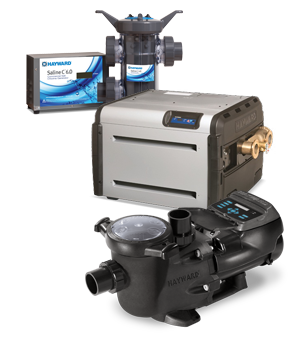 Consult with your Hayward salt chlorination dealer for technical advice and help choosing salt chlorination products that are right for your pool. For any pool, salt water operated or not, a drop in pH can be the biggest culprit to equipment damage, particularly metals. As for salt, some metal damage can occur overtime IF the system is not properly installed—proper installation means proper electrical grounding and bonding of the equipment. Likewise, using the correct quantity of salt in your pool produces luxurious, clean water. That said, too much salt can be corrosive to pool decks, railings, and equipment. Play it safe by contacting your local pool professional to ensure you are using the correct amount of salt in your pool. Click here for quick facts about salt chlorinated pools. Leave a comment on our Facebook page if you have any questions about Salt Chlorination.